Birding From the Hip is a collection of forthright, entertaining and gloriously funny stories describing an obsessive Irish birder’s view of life. Anthony McGeehan has been writing incorrigible tales about birdwatching for more than twenty years and this is his first book. 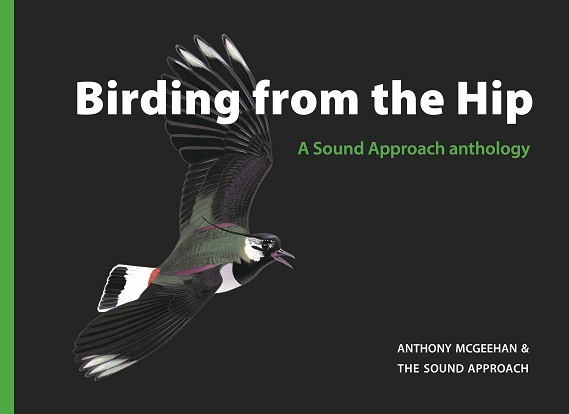 Vintage articles sit alongside many new pieces, compiled as The Sound Approach travels with Anthony on fresh adventures to record his favourite bird sounds. Rasping Corncrakes reverberating from churchyard walls, Lapwings celebrating Saint Patrick’s Day and a triumphant chorus of thousands of Cranes returning to roost on a starry Spanish night – hear them all and more amid a selection of stories narrated in two free CDs.